May 31, 2015  Beau Biden, Vice President Joe Biden's older son, has died after battling brain cancer, the vice president announced Saturday. Beau Biden, a former attorney general of Delaware, was 46. May 29, 2015  The former Maryland governor — Democrat Martin O'Malley — is expected to formally announce his candidacy on Saturday in Baltimore. For most voters he's a blank slate. May 20, 2015  Six months ago, President Obama announced executive actions that would protect millions of immigrants who are undocumented from deportation. But those actions are on hold pending a lawsuit. 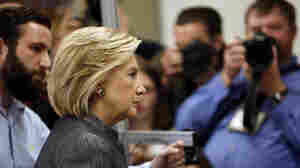 May 19, 2015  Campaigning in Iowa Tuesday, former Secretary of State Clinton said the timing of the release is beyond her control. 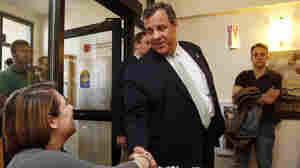 It was the first time she answered questions from the press in several weeks. May 19, 2015  Latino voters in swing states like Nevada could decide the outcome of the 2016 race for president. Democrats have historically had a lock on their vote. But Republicans think they can change that. May 15, 2015  The Clinton campaign revealed just how much the former president and secretary of state made in 2014 and 2015. May 13, 2015  It has been more than three weeks since Hillary Clinton has answered a question from the press. That hasn't stopped reporters from trying. May 9, 2015  Hillary Clinton brought her presidential campaign to Rancho High School in Las Vegas this week. It's a school full of DREAMers with big plans for the future, and they aren't afraid of politics. May 8, 2015  This week, Hillary Clinton called for a broad path to citizenship for many of the 12 million people in the United States illegally. 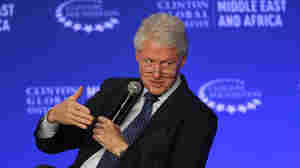 Doing so opens Clinton up to charges of flip-flopping. May 6, 2015  Speaking in Las Vegas, she said it was time to provide a path to citizenship for immigrants in the country illegally and that she could go "even further" than Obama's controversial executive actions. 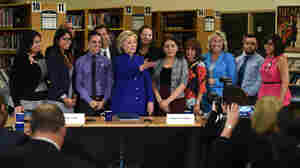 May 6, 2015  Democratic presidential contender Hillary Clinton went to a high school in Las Vegas on Tuesday and said it was time to provide immigrants in the country illegally with a path to citizenship. 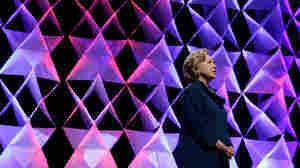 May 5, 2015  Hillary Clinton is expected Tuesday to lay out her plan for a path to citizenship for many who are presently in the United States illegally. Meanwhile, her campaign is ramping up its efforts to get ahead of the scandal stories involving a new book about the Clinton Foundation and the upcoming Benghazi hearings.